Cranes have always carried cultural significance for the Japanese, and over the past six months, they’ve come to represent something special for my family as well. 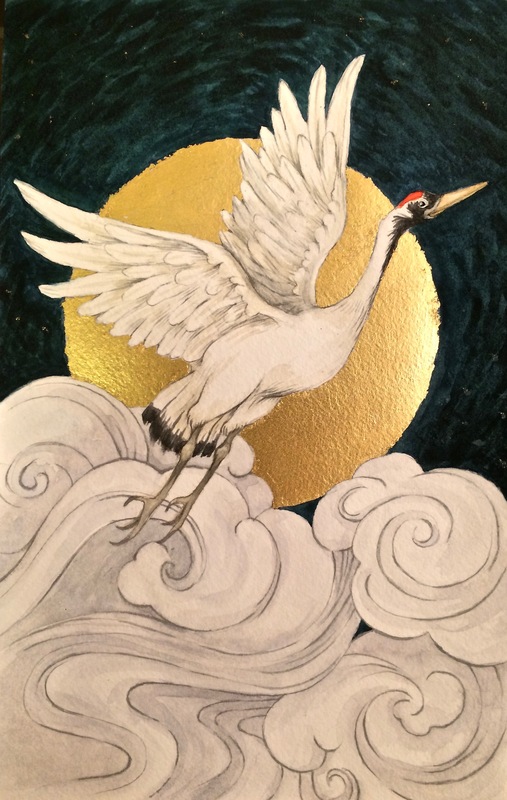 Revered in Japan as symbols of longevity and luck, cranes are thought to be “well-behaved like gentlemen, incorruptible and naturally clean and honest.” This could not more aptly describe my father’s personality. In his honor, our family and dearest friends spent countless hours folding 1,000 cranes in the tradition of senbazuru. There are many interpretations of this practice, but the prevailing idea is that the act of folding cranes is to make a wish– for health, happiness, love or peace. Spirituality is deeply personal and uniquely expressed, and I think each person who touched this project found their own catharsis or purpose. Mine was to mirror my father’s persistence and patience, and to engage myself in a process that felt meditative, helping to quiet my mind. Since completing the cranes, I’ve been seeking other outlets for my creative energy. It was one of my dad’s wishes that I revisit drawing and painting, as art gave me so much joy growing up. Since graduating from art school, I’ve allowed those muscles to atrophy. Holding a pencil in my hand feels awkward still, and I’ve lost the confidence and adeptness that come with practice. But I do have the inspiration, now, to persevere.